I want Zayn to experience the things I have not experienced when I was young. I want to expose him to different environments so he won't be as ignorant as I was back then. When he turned six last February, I wanted him to experience the wild and see the animals he only saw in books. So when my blogger friends (hello Gay, Hannah, and Pam!) and I met one day, we planned a trip to Cebu Safari and Adventure Park. 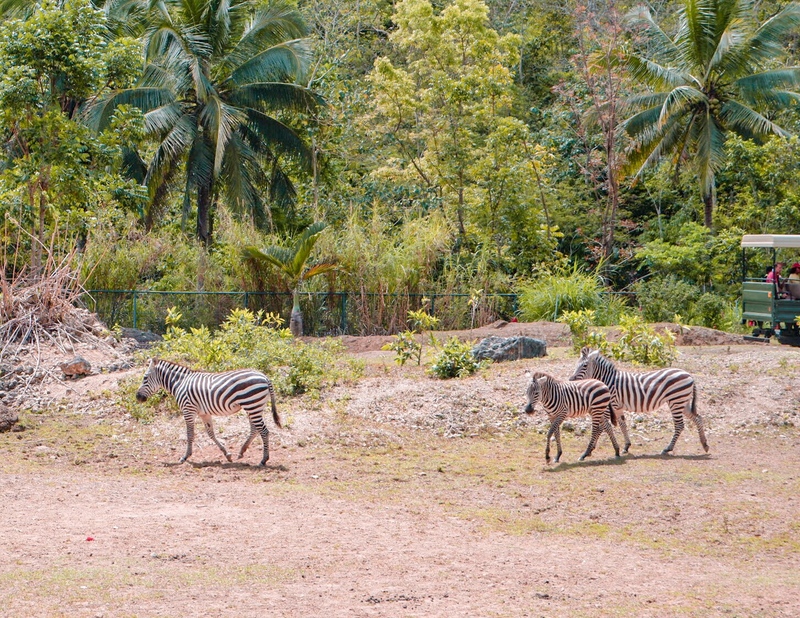 Cebu Safari and Adventure Park, I believe, is the first safari park in Cebu and it's said to rival with the animal parks and zoos worldwide. It is located atop the hills of Carmen and showcases various birds, mammals, and reptiles. We went there via van by Cebu Trip Rent-a-Car. However, if you prefer to commute, you can take any bus going north and tell the driver or the konduktor to drop you off Carmen Plaza. From there, you can take a habal-habal or vans going to the park. We arrived at Cebu Safari and Adventure Park around 9AM. While buying the tickets, the attendants briefed us about the park, their policies, exhibit schedules, and other instructions. They gave us each a map of the whole safari park too. Zayn was super excited when we rode the tram going to the park. But at first, he didn't show any interest with the animals we first saw. When we got to the snakes area, he got really scared because he is afraid of them but when Asha (Pam's daughter) talked to him, he eventually calmed down and wanted to see the snake again. And now he keeps telling me that he wants a pet snake. Haha! We didn't get to see the orange and white tigers because we got there before their feeding time. We wanted to go back but we were too tired already. It was quite a challenge to walk to the tram stations and wait for the ride. The African Savanna Tour was nice because we got to see zebras, wild bucks, wildebeests, and more. Although the tour was done via tram, because it wouldn't be safe for the guests if they walk around the area, it was still a great experience. We watched the bird show at 1:45PM and it was jam-packed. Zayn was amazed seeing the tricks done by the birds especially when the birds were asked to spell words and do simple mathematical operations. He kept asking me how the birds did it and I just told him that the birds were vigorously trained. The bird show was definitely one of the highlights of the park and should not be missed. I, myself, was really amused with the cute birds. They are open from Wednesday to Sunday, 8AM to 5PM. You can buy tickets on their website but they do allow walk-ins too. However, you need to take note that they only sell tickets until 1:30PM because the tour requires at least 3 hours for you to fully maximize it and the last bird show is at 1:45PM. Food and drinks are not allowed to be brought inside the park since have restaurants and food outlets inside. Ticket price does not include a free lunch anymore.